Jacksonville International Airport in 2005. 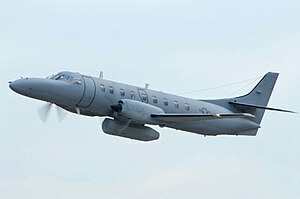 The Fairchild Aircraft C-26 "Metroliner" is the designation for the Fairchild Swearingen Metroliner series twin turboprop aircraft in the service of the United States military. It was not officially named by the US Armed Forces, but is unofficially known by the same name as its civilian counterpart. The C-26A is the military version of the Model SA227-AC Metro III; the C-26B is the military version of the Model SA227-BC Metro III and Model SA227-DC Metro 23; and UC-26C is the military designation for the Model SA227-AT Merlin IVC. The United States Air Force bought eleven C-26A aircraft based on the SA227-AC, two of these being supplied to the Venezuelan Air Force. The first three C-26Bs were procured later in the 1980s, two for the US Army and one for the USAF. These three had been built as SA227-BC models. Later C-26Bs were the military equivalent of the Metro 23 and the USAF took delivery of 37 examples. Some of these were transferred to the Peruvian Air Force and the US Army, while six were transferred to the US Navy as C-26Ds. The US Army also took a second-hand Merlin IVC and operated it as the solitary UC-26C. An RC-26B sits at Jacksonville ANG Base in February 2005. A Metro III, c/n AC-614, was modified as the Fairchild Aircraft/Lockheed Multi Mission Surveillance Aircraft, featuring a Lockheed phased array radar in a long pod under the fuselage. Several aspects of the MMSA aircraft were incorporated on some USAF C-26s redesignated as the RC-26B, operated by the Air National Guard (ANG) in various states. These aircraft have been primarily used for Department of Defense reconnaissance mission support to various agencies of the Department of Homeland Security such as the United States Coast Guard (USCG) and Customs and Border Protection (CBP) in the War on Drugs, and to USCG and/or the Federal Emergency Management Agency (FEMA) in the wake of natural disasters. The RC-26B aircraft were originally configured with a belly pod containing a sensor turret and a data recorder. Recently, this pod has been removed and a sensor turret has been added to the belly of the aircraft. Some of the RC-26Bs were operated for a time with civil registrations. The US Navy operates several C-26D aircraft, modified for range support, at the Pacific Missile Range Facility Barking Sands. Military version of the Metro III (Model SA227-AC). Military version of the Metro III (Model SA227-BC) and Metro 23 (Model SA227-DC). C-26B modified with electronic surveillance equipment for drug interdiction missions (USAF operates 11 within the Air National Guard). Was a used 1983-built Merlin IVC operated for several years as 89-1471. Modified with an integrated sensor package including forward looking infrared and high resolution radar. C-26Bs transferred from USAF inventory and modified with new navigation equipment for the US Navy, four used for rapid response cargo and passenger transportation in Europe. One range support aircraft operated by the US Navy's Pacific Missile Range Facility Barking Sands. Two range support aircraft operated by the US Navy's Pacific Missile Range Facility Barking Sands with installed radar units. Upgrade of 11 C-26B aircraft including an improved Rockwell Collins Proline 21 Electronic Flight Instrument System. ↑ 4.0 4.1 Turboprop Production Lists Home Page Metro production list accessed via this site 25 August 2007. ↑ Baugher, Joe. "USAF FY1986 Serial Number list." USAF Aircraft. Retrieved: 11 June 2011. ↑ Verified by conducting an online search of the Fuerza Aérea Venezolana database at http://www.scramble.nl/dbmil.htm on 25 August 2007, using the serial numbers "0009" and "1964". It would appear that the USAF took delivery of two aircraft serialled 86-0456 and the first (Fairchild c/n AC-745B) was passed to the FAV as 0009, the second being procured to replace that aircraft. The USAF FY1986 Serial Number list has 86-0455 (Fairchild c/n AC-744B) going to the FAV, but the other sources show it was 86-0456/AC-745B. ↑ Baugher, Joe. "USAF FY1990 Serial Number list." USAF Aircraft. Retrieved: 11 June 2011. ↑ Baugher, Joe. "USAF FY1991 Serial Number list." USAF Aircraft. Retrieved: 11 June 2011. ↑ 9.0 9.1 Baugher, Joe. "USAF FY1989 Serial Number list." USAF Aircraft. Retrieved: 11 June 2011. ↑ "Coastwatch Tender to Usher In New Age of Surveillance." Australian Aviation magazine No. 93, December 1993, pp. 24–27. Aerospace Publications Pty. Ltd. ISSN 0813-0876. ↑ "C-26." Globalsecurity.org. Retrieved: 11 June 2011. ↑ Picture of the Fairchild RC-26B Metro 23 (SA-227DC) aircraft Retrieved 21 August 2011. ↑ Picture of the Fairchild C-26D Metro 23 (SA-227DC) aircraft Retrieved 21 August 2011. ↑ Airman, 2007 special edition, published by the USAF. Wikimedia Commons has media related to Fairchild Metroliner.